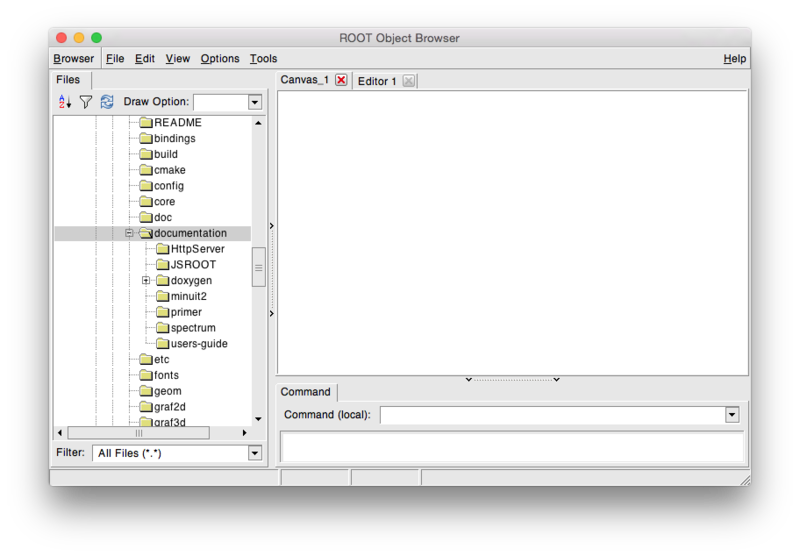 Using a TBrowser one can browse all ROOT objects. Definition at line 37 of file TBrowser.h. Definition at line 52 of file TBrowser.h. The last TObject selected by user. Option_t * opt = ""
Create a new browser with a name, title. Width and height are by default set to 640x400 and (optionally) adjusted by the screen factor (depending on Rint.Canvas.UseScreenFactor to be true or false, default is true). Definition at line 84 of file TBrowser.cxx. Create a new browser with a name, title, width and height. Definition at line 106 of file TBrowser.cxx. Create a new browser with a name, title, position, width and height. Definition at line 121 of file TBrowser.cxx. Create a new browser with a name, title, width and height for TObject *obj. Definition at line 136 of file TBrowser.cxx. Definition at line 154 of file TBrowser.cxx. Definition at line 169 of file TBrowser.cxx. Definition at line 185 of file TBrowser.cxx. Definition at line 205 of file TBrowser.cxx. Definition at line 221 of file TBrowser.cxx. Definition at line 238 of file TBrowser.cxx. Add object with name to browser. If name not set the objects GetName() is used. If check < 0 (default) no check box is drawn, if 0 then unchecked checkbox is added, if 1 checked checkbox is added. Definition at line 261 of file TBrowser.cxx. Add foreign object with name to browser. and the value of obj is not necessarily the start of the object. If check < 0 (default) no check box is drawn, if 0 then unchecked checkbox is added, if 1 checked checkbox is added. Definition at line 280 of file TBrowser.cxx. Add checkbox for this item. Definition at line 294 of file TBrowser.cxx. Definition at line 90 of file TBrowser.h. Change status of checkbox for this item. Definition at line 304 of file TBrowser.cxx. Create the browser, called by the ctors. Definition at line 324 of file TBrowser.cxx. Definition at line 246 of file TBrowser.cxx. Definition at line 106 of file TBrowser.h. Execute default action for selected object (action is specified in the $HOME/.root.mimes or $ROOTSYS/etc/root.mimes file). Definition at line 357 of file TBrowser.cxx. Definition at line 92 of file TBrowser.h. Definition at line 94 of file TBrowser.h. Definition at line 104 of file TBrowser.h. Definition at line 95 of file TBrowser.h. Definition at line 96 of file TBrowser.h. Definition at line 98 of file TBrowser.h. Recursively remove obj from browser. Definition at line 366 of file TBrowser.cxx. Definition at line 377 of file TBrowser.cxx. Remove checkbox for this item. Definition at line 314 of file TBrowser.cxx. Definition at line 93 of file TBrowser.h. Definition at line 103 of file TBrowser.h. Definition at line 97 of file TBrowser.h. Assign the last selected object. Definition at line 387 of file TBrowser.cxx. Definition at line 110 of file TBrowser.h. Definition at line 102 of file TBrowser.h. Definition at line 113 of file TBrowser.h. Definition at line 116 of file TBrowser.h. Definition at line 48 of file TBrowser.h. Definition at line 46 of file TBrowser.h. Definition at line 40 of file TBrowser.h. Definition at line 49 of file TBrowser.h. Window system specific browser implementation. Definition at line 47 of file TBrowser.h. ROOT 6.17/01 - Reference Guide Generated on Fri Apr 19 2019 04:54:17 (GVA Time) using Doxygen 1.8.14.